One day, not so very many years ago, a small peasant boy was chosen to study ballet at the Beijing Dance Academy. His mother urged him to take this chance of a lifetime. But Li was only eleven years old and he was scared and lonely, pushed away from all that he had ever known and loved. He hated the strict training routines and the strange place he had been brought to. All he wanted to do was go home - to his mother, father and six brothers, to his own small village. But soon Li realised that his mother was right. He had the chance to do something special with his life - and he never turned back . 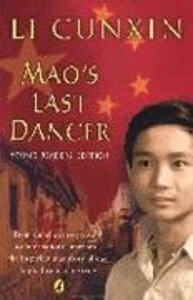 . .
About "Mao's Last Dancer (Young Readers Edition Series)"
Li Cunxin was born into poverty in the Shandong province of People's Republic of China. At the age of eleven, he was selected by Madame Mao's cultural advisers to attend the Beijing Dance Academy, where students endured 16-hour days of training. He was one of the first students from the Beijing Dance Academy to go to the United States. In the 1970s, he joined Ben Stevenson's Houston Ballet company as an exchange student. He also began a relationship with an aspiring American dancer, Elizabeth Mackey. They quickly got married so that Li could remain in the United States and avoid deportation. In the end, his Chinese citizenship was revoked. In 1995 he moved to Melbourne to join the Australian Ballet. In 1987 he married again to Australian dancer Mary McKendry. They have three children together. In 2003 Li published his autobiography, Mao's Last Dancer. The book has become a feature film with the same title. It will be released in 2010. It was 60 years ago that rural pastor David Wilkerson dared to make a difference to New York's gang culture. With nothing but the power of the gospel, Wilkerson changed young lives caught up hopelessly in drugs and violence. This special young readers' edition brings this powerful story to a new generation!